Big Ring, to his credit, took the challenge seriously. He told me he didn’t want to pick something super easy, or super hard for that matter, just the right recipe to hone my skills, give me a challenge, but not send me into a flurry of F bombs. 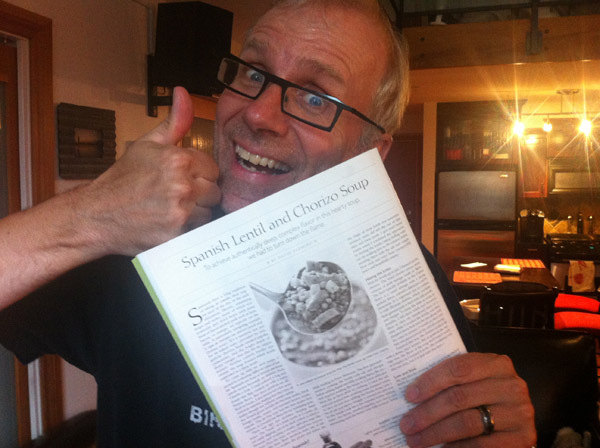 The result: Spanish Lentil and Chorizo Soup. Big Ring picked well; this recipe was full of Cooking 101 lessons. I learned NOT to stand so close to a pan of spitting, angry oil, but only AFTER having my arms, chest and cheeks painstakingly charred! I learned that unless I want eyeliner streaks staining my cheeks, I must invest in a pair of onion goggles. And I learned the definition of simmer, a term I’ve thought for years meant to cook over the lowest temperature. But nope, that’s not it at all. That’s a cup of tears right there! I also learned a new technique – Sweating Out The Veggies – that’s not so 101, but maybe a wee bit more advanced dare I say 😀 Sweating out involves cooking the vegetables super slow to produce a “sweet, vegetal taste” that wouldn’t overpower the entire dish. Big Ring thought this technique would be the hardest for me, probably because of my tendency towards impatience, but it was actually quite easy. I just had to keep an eye on it, and make sure it didn’t brown, or goodness forbid, BURN! All in all, I kind of liked this recipe. Even though it was time consuming as hell chopping and measuring all those dang vegetables and sweating them out, and prepping the lentils, and sauteing the spices into a “fragrant bloom,” etc., etc., when it finally came together, it was a thing of beauty in my mouth. (Who ever thought I’d say that about my cooking!!!) The melding of the flavours, the stick-to-your-bones lentils, the juiciness of the sausage, it warmed my belly with pure happiness. And the next day, oh man, the flavours were so much more intensified. It was not only Princess approved, it was Big AND Little Ring approved too! 1. Place lentils and 2 teaspoons salt in heatproof container. Cover with 4 cups boiling water and let soak for 30 minutes. Drain well. 2. 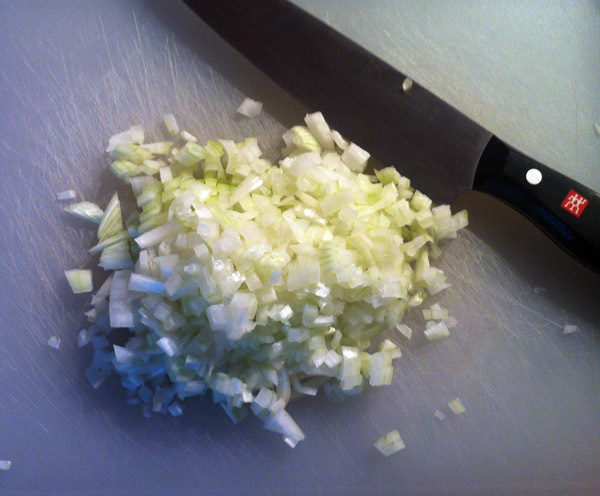 Meanwhile, finely chop three quarters of onion (you should have about 1 cup) and grate remaining quarter (you should have about 3 tablespoons). Heat 2 tablespoons oil in Dutch oven over medium heat until shimmering. Add chorizo and cook until browned on all sides, 6 to 8 minutes. Transfer chorizo to plate. Reduce heat to low and add chopped onion, carrots, 1 tablespoon parsley, and 1 teaspoon salt. Cover and cook, stirring occasionally, until vegetables are very soft but not brown, 25 to 30 minutes. If vegetables begin to brown, add 1 tablespoon water to pot. 3. Add lentils and sherry vinegar to vegetables; increase heat to medium-high; and cook, stirring frequently until vinegar starts to evaporate, 3 to 4 minutes. Add 7 cups water, chorizo, bay leaves, and cloves; bring to simmer. 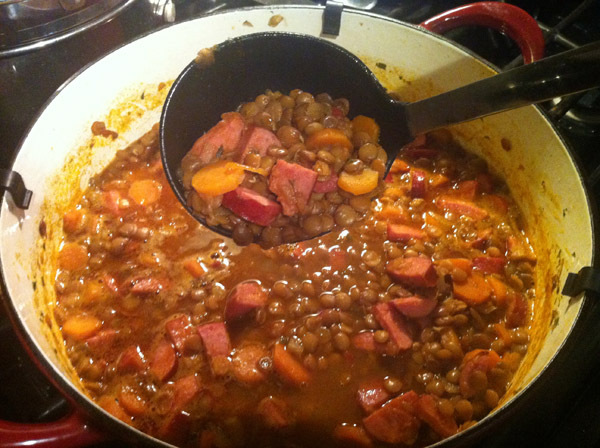 Reduce heat to low; cover; and cook until lentils are tender, about 30 minutes.